As time goes on, I start to think maybe I should just run a roast chicken food blog. I make it almost enough. This version was particularly good – basically a jazzed up version of BBQ chicken. I did not brine the meat here, as I usually do, but it was still juicy and tender. As you can see from the picture after the jump, I browned my skin a little bit too much and should have tented this with foil a bit earlier. Luckily, the flavors of the meat weren’t affected – the sugars in the chipotle-garlic glaze simply over-caramelized resulting in blackening. Take my mistakes as a lesson learned and look at it frequently to figure out when to tent. 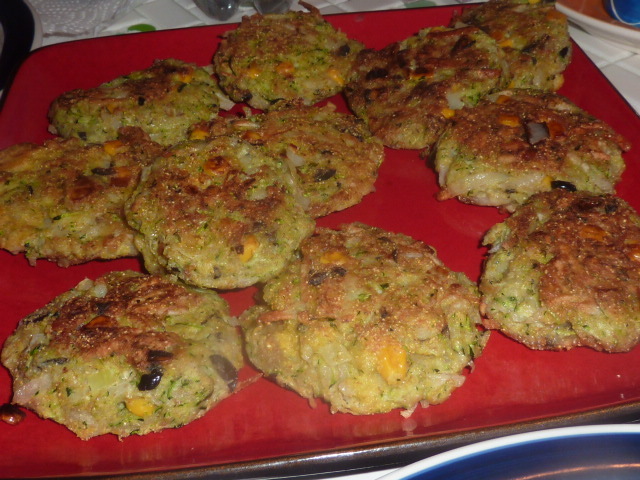 The cornmeal-zucchini “latkes” went really well with the BBQ chicken due to their southwestern flavors. They went really well with the chipotle-garlic glaze as a dipping sauce and were excellent topped with a few bites of the roast chicken. They would work equally well as an appetizer served simply with the plain Greek yogurt. Remove chicken from oven and place on a roasting rack on top of a baking sheet lined with tinfoil. Season with kosher salt and freshly cracked black pepper. Allow to sit overnight, uncovered, in refrigerator to allow moisture to evaporate from skin. Before beginning glaze, remove chicken from refrigerator and allow it to come to room temperature. Heat olive oil over medium heat. Add onions and cook until golden brown, about 15 minutes. Increase oven temperature to 475º. Using a pastry brush, coat chicken all over (including in the cavity) with the caramelized chipotle-garlic sauce, using half of the sauce or slightly less. Place chicken in preheated oven on center rack. Roast at 475º for 15 minutes or until skin is light golden brown and sauce has formed a glaze. Remove from oven and brush with sauce. Reduce heat to 350º. Roast chicken roughly 20 minutes per pound (rounding up to nearest pound), or until meat thermometer inserted into the thickest part of the chicken’s thigh reads 185º. Baste periodically with remaining chipotle-garlic sauce. If chicken becomes overly brown, tent with a piece of tinfoil. When fully cooked, remove chicken from oven and cover with tinfoil. Rest 15-20 minutes, which will allow juices to redistribute and result in a tender, juicy bird. Serve with cornmeal-zucchini “latkes,” remaining chipotle-garlic sauce, and plain Greek yogurt. Mix zucchini, potato, onion, corn kernels, and black olives. Squeeze out extra moisture using cheese cloth or paper towels. Add eggs to vegetable/potato mixture. Mix in flour, cornmeal, kosher salt and freshly cracked black pepper. Mix together well with your hands. Heat a tablespoon or two of canola oil in a large sauté pan. Form vegetable/potato, egg and flour mixture into patties roughly 2 inches across and 3 inches long. Sauté roughly 5 minutes per side until golden brown, adding canola oil as necessary. Drain on paper towels. Serve warm with plain Greek yogurt and the chipotle-garlic glaze from above. I’m a shiksa (non-Jewish woman, for you other gentiles out there), Zak is Jewish. Meaning he was raised on latkes. His grandmother made them, his mother makes them, and he made sure to let me know that the first time I suggested making latkes. I think his close-to-exact words were, “Just so you know, you have a lot to live up to. My grandma and mom both make killer latkes. I’m not saying you can’t do it, but just … be aware.” Talk about a lot of pressure! So, I decided to mix it up from the traditional latkes to give myself something of an edge. My mom had found a zucchini latke recipe to use up some of the copious zucchini from their garden, so I did some Googling of my own and adapted my own version from this recipe at Food Network. They turned out absolutely delicious. Zak had no complaints, which made me very happy. The latkes would make a delicious appetizer, too. Pairing these with the soup was a good idea. 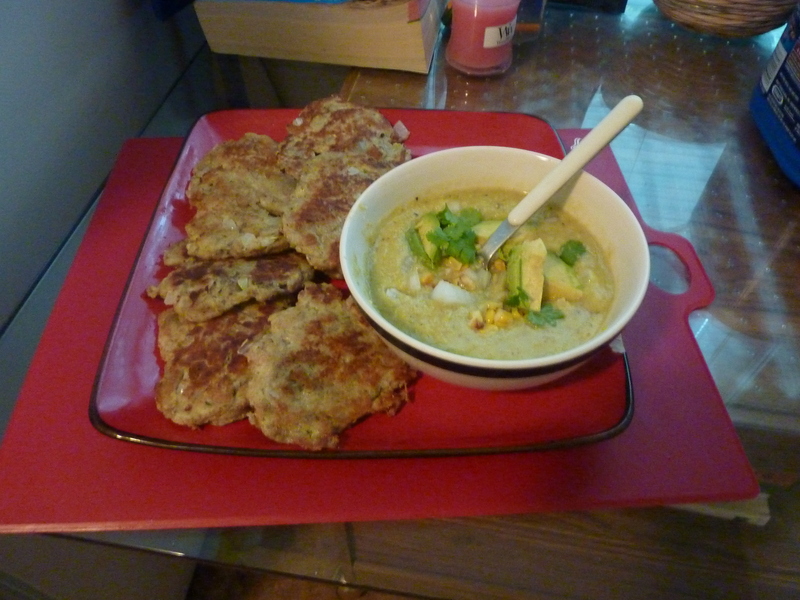 The soup ended up VERY spicy, so the creaminess of the latkes and sour cream really helped cool it down. All in all, this was a fresh, summery, yummy and very healthy meal. Admittedly, it was a lot of work, but I had my favorite kitchen helper, Roo, to keep me company¹. Preheat broiler and cover baking sheet with tinfoil. Spray with cooking spray and place shucked corn, jalapeño and cubanelle on baking sheet. Spray with cooking spray and place in broiler. Broil, turning occasionally, roughly 15 minutes until the skins of peppers are charred and blistered. Remove the peppers from the baking sheet and place immediately in a plastic zip lock bag (the steam will make peeling the peppers much easier). Return corn to the broiler and broil additional 15 minutes until corn is browned and charred. Let corn and peppers cool. Remove peppers from plastic bag and peel off outer layer of skins. Discard. Remove most of ribs and seeds from the peppers, depending on how spicy you would like your soup (I left about 1/4 of the seeds and it was SUPER spicy). Cut kernels off of the corn, reserving 1/2 cup of kernels for serving. Cut the corn cobs into thirds. Bring corn kernels, cobs, 1/2 of chopped Vidalia onion (reserving the other half for serving), chicken stock, and water to a boil, covered. Reduce heat to a low simmer, remove cover and simmer until reduced by 1/3. Remove from heat and let cool to room temperature uncovered. Remove corn cobs and discard (or save for additional stock making). In a food processor, puree mixture with peppers, lemon zest, juice from 1 lemon, and about 3/4 of the avocado (roughly 1/2 cup). Reserve the rest of the avocado in slices for serving. Cool pureed mixture in the refrigerator until serving time. Serve with reserved onion, corn, sour cream and cilantro. Mix zucchini, potato, and onion. Squeeze out extra moisture using cheese cloth or paper towels. Whisk together eggs and add to vegetable/potato mixture. Mix in flour, bread crumbs, pepper and garlic salt. Mix together well with your hands. Heat a tablespoon or two of vegetable oil in a large sauté pan. Form zucchini, potato, egg and flour mixture into patties roughly 2 inches across and 3 inches long. Sauté roughly 5 minutes per side until golden brown, adding vegetable oil as necessary. Serve warm with sour cream. Except where otherwise noted, all recipes are cooked, created and photographed by me, kelseyincleveland. All material on this website is copyrighted.